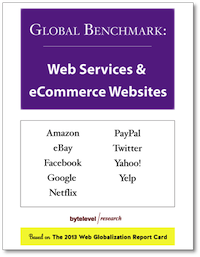 What companies are doing the best job of taking their websites global and mobile? What are the top best practices in web globalization? What are the most popular languages across all websites? What websites offer the best global gateways? How are companies integrating and promoting Twitter and Facebook on their local websites? What mobile apps support the most languages — and what languages exactly? This report, now in its ninth edition, answers these questions and many more. 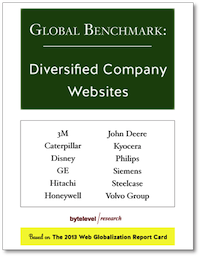 You’ll learn exactly which companies are improving at web globalization — and why. Through detailed website profiles, loaded with screen shots, you'll learn which practices to emulate and which to ignore. An entire section is devoted to the top 20 best practices and top 10 emerging trends in web globalization. If you would like to purchase please email us. 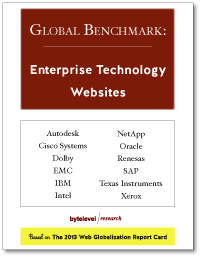 Select an additional benchmark report with your purchase. 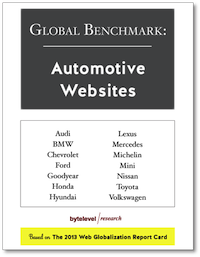 Each report provides in-depth analysis of websites within each industry, along with key language trends and best practices. Google is no stranger to the top spot, but this is largely because Google has not stood still. With the exception of navigation (a weak spot overall) Google continues to lead not only in the globalization of its web applications but its mobile apps. YouTube, for example, supports a 54-language mobile app. Few apps available today surpass 20 languages; most mobile apps support fewer than 10 languages. 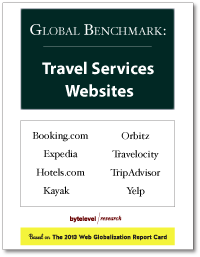 Hotels.com has done remarkably well over the past two years and, in large part, due to its investment in mobile websites and apps. Philips improved its ranking due to its improved global gateway. 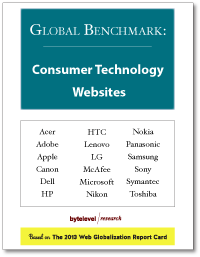 And Microsoft and HP also saw gains due to their website redesigns, which also included improved global gateways. New to the Top 25 this year are Starbucks, Merck, and KPMG. 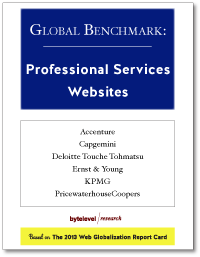 We survey a wide swath of global companies across all major industries to provide a well-rounded overview of the state of web globalization. Within each industry, we include the leading companies with a focus on brand leadership. We include more than 30% of the Fortune 100 companies and 70% of the 2013 Interbrand 100 Best Global Brands.